Not too long after I graduated from college, I moved into a 500-square-foot L-shaped studio on the 20th floor of a building on West 14th Street. 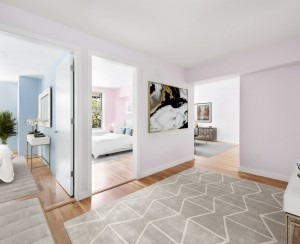 It was rent-stabilized--about $500 under market value-- so the price was right and I liked the location a lot. Not the street, though. I never liked being on the always busy (and slightly dingy) 14th Street. What I liked was being so close to the Village and Chelsea. 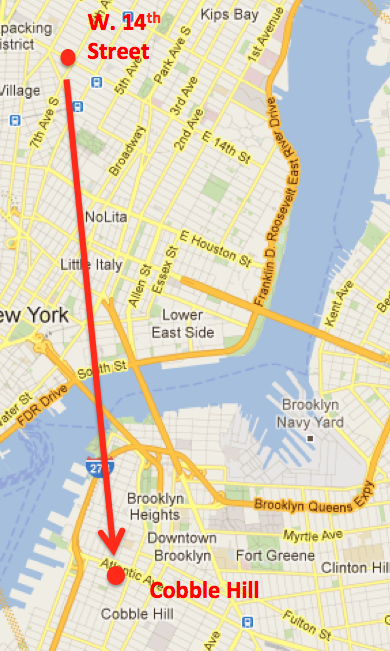 And transportation was great—10 subway lines only steps away. When I went away to business school in 2008, my then-girlfriend/now-wife moved into the apartment. After graduation, we got married and I moved back in, but it became apparent pretty quickly that we'd need more room. What we really needed was an inside door we could close if one of us wanted to watch TV, read or just have some privacy. We agreed on Brooklyn—that's where lots of our friends had moved—so we started a regimen of weekend walks through the likely neighborhoods: Brooklyn Heights, Cobble Hill, Park Slope (which is nice enough but the stroller mafia was a turn-off). 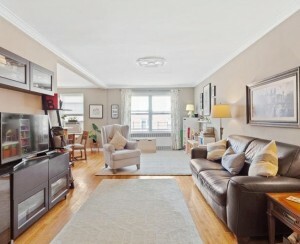 When we got to Carroll Gardens we were hooked—I think it was its neighborhood-y feeling. Carroll Gardens is just about 10 blocks of low-rise residential buildings with Smith Street and Court Street the main commercial hubs for shops, restaurants and dry cleaners. It still has the feel of an old Italian family-focused neighborhood with delis, restaurants and social clubs, complete with the requisite old Italian guys sitting outside. We've been here for almost a year, enough time to choose a favorite pizza place—Lucali--where the chef is from the 'hood, and a favorite deli—Caputo's—for cheese, meat, pastries and fresh pasta. I like the small farmers' market in Carroll Park and the fact that there are lots of little gardens throughout the neighborhood. Some day we'd like to get involved with one, do a little planting and get a key to the garden. Now we just don't have the time. Our building is brand new—we're the first tenants in our apartment—and because it is seven stories high, its construction was contested by some of the community residents. In Manhattan, no one would ever even notice a building this size going up. Our apartment is a one-bedroom, about 775-square-feet, and we have that coveted door that separates the living room and the bedroom. Now my wife, who is going to business school here in the city, can study out in the living room and I can hang out in the bedroom. At first, she was a little skeptical about living in a single-line subway zone—only the F runs out to our neighborhood—but I grew up on the No. 1 line and never had a problem. She's gotten over it and her daily commute to the West Village and mine into midtown are pretty painless. Our neighbors in the new building are, shall I say, a little less crazy and a lot younger than the ones in the old. I mean “crazy” in the New York sense—people like Myra who would sit in the lobby on 14th Street all day long and complain non-stop about her apartment and just about everything else. We want to stay here. Even if we could afford to move back to Manhattan, I wouldn't do it. My wife likes Dumbo because it's cool and loft-y but I'm old school and like it here where everything feels pretty much the same as it was when this whole chunk of New York was called South Brooklyn.